As has been widely reported, state appropriations for public higher education have declined considerably over the last several years, leaving public colleges and universities to become increasingly dependent on tuition revenue and outside funding sources, rather than on government-issued funds. This troubling retrenchment of support is likely to have long-term economic and social implications, a fact that should give us all pause. In July 2015, just two years after I had been named the Associate Vice President and Director of Athletics at NIU, Illinois entered a two-year period of budgetary uncertainty and instability, making the matter of declining state support of public higher education one of considerable professional consequence. The two-year budget impasse, which followed years of arguably disappointing state support of higher education, starved many of Illinois’ public colleges and universities, forcing them to eliminate jobs and reduce select services and programs. NIU was not immune to the record-setting budget stalemate and the campus, including the athletics department, felt its adverse impact. 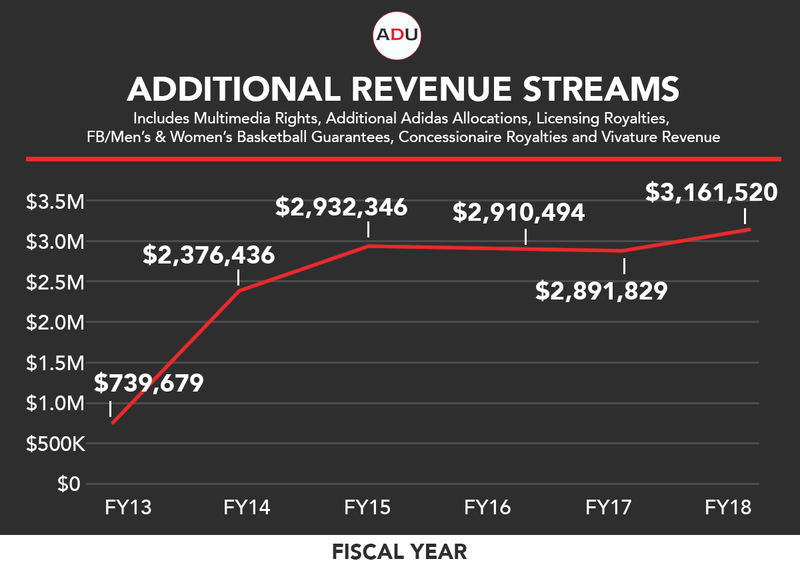 I understood, when I assumed the NIU athletic director post, that boosting revenue generation was not a desired outcome but an expectation, not unlike graduating student-athletes and winning championships. Yet, the budget impasse placed emphasis on revenue generation in new and unexpected ways, at times forcing a reactive and admittedly stressful relationship with the area. Aware that Division I athletic programs cannot be seen as siphoning money away from the academic enterprise, particularly during periods of financial difficulty, I knew that we needed to view revenue generation not as a back-office activity, but as a vital strategic function, one that routinely influenced departmental decisions. In short, we needed a strategic plan that called on athletic department staff to be, at all times, intentional about revenue generation. Strategic planning has proliferated college athletics for quite some time, with many believing it is a marker of a mature, stable organization. When I first arrived at NIU, it was clear that an operational strategic plan, rather than an abstract one, would be of considerable benefit to a department that was craving a look into its financial future. The budgetary circumstances were such that staff members and coaches needed reassurance that the university’s financial challenges could be translated into a series of actionable items and achievable projects. As such, I resisted the knee-jerk response of making immediate or deep cuts to programming, services and staff, and I instead engaged others in collecting the qualitative and quantitative data that would inform the department’s revenue generation efforts. Based on the feedback received, insights shared, and institutional data collected, my colleagues and I agreed that we needed to establish a financial structure that reinforced the department’s mission and vision, used resources efficiently, and was responsive to change. To mitigate the risk of relying too heavily on one funding source, we also recognized the need to pursue a diversified funding approach, which sounds eminently logical but can occasionally be forgotten about when one funding avenue is going well. Further, we needed to stop pulling punches and start confronting the reality of what it costs to operate a nationally competitive athletic department at the Division I level. Perhaps most importantly, we needed to commit to capturing and capitalizing on academic and athletic excellence, increasing external engagement and galvanizing NIU’s alumni base, and developing the internal capacity to support revenue generation in specific and measurable ways. Understandably, individuals and corporate partners are more inclined to lend their support when they understand the intended and actual impact of their contributions. During the 2015-16 academic year, we established the Victor E. Ball, a fundraising event designed to showcase the accomplishments of NIU student-athletes and raise money for Cost of Attendance. Since its inception, the event has raised nearly $525,000 in support of Huskie student-athletes. In 2017, we launched the “Campaign to Sustain,” an initiative focused on generating financial support for Cost of Attendance and capital projects. As of June 2018, the campaign, which encourages enthusiasm for the past and potential success of Huskie student-athletes, has raised over $1 million. Putting a face on athletic giving and taking the time to tell the NIU student-athlete story played an instrumental role in generating revenue during the budget impasse, and it continues to be a cornerstone of our approach to athletics development. NIU is located 70 miles west of Chicago with more than 150,000 alums living in the Chicago metropolitan area. The budget impasse challenged us to methodically assess our alumni base, particularly that of the Chicagoland area, to understand the motivating factors behind alums’ decisions to financially contribute to athletics. We realized that our pitch package, our carefully crafted reasoning for why alums should contribute, needed to resonate with donors’ personal narratives. The emotional, visceral draw of athletics needed to be fully integrated into our messaging so that donors saw a part of themselves in the athletic experience. Thus, in our direct and indirect contact with existing and potential donors, we sought to promote the work ethic, integrity, and family and community centered identity of NIU administrators, coaches and staff. In trying to understand our alumni network’s values, the transactional nature of our athletic donor base became increasingly clear. Donors were largely no longer contributing solely on the merits of the department but on the value derived from a relationship with the department. This element of exchange, a recognition that a sizeable number of NIU alums were more inclined to give when the value of the benefits received as a result of their contribution exceeded the cost of making the donation, encouraged us to appeal not only to goodwill but also self-interest. Consequently, we worked tirelessly to provide our alumni base with an array of giving options that promised access, information, and heightened fan experiences in exchange for financial contributions. The provision of premium seating, sales of which increased 19 percent in 2017-18, is a prime example of how we have responded to the transactional demands of our donor base. Partnerships with Learfield Licensing, Adidas, and Sodexo have also enabled us to deliver more financially and emotionally rewarding fan experiences. It’s not uncommon for those who don’t work directly in athletics development to bristle or balk at athletic business activities, but at NIU, our administrators and coaches understand that such activities are necessary for success. We actively seek to hire individuals who are passionate about their chosen area of expertise, understand and appreciate the Huskie way, and are receptive to and supportive of revenue generation efforts. At the same time, we strive to create an inclusive, family-oriented culture that celebrates and respects personal and professional opportunities, emphasizes the importance of trust and transparency, encourages the expressing of opinions and sharing of ideas, and provides time and space for self-care to ensure long-term productivity on and off the playing field. By prioritizing the above and demonstrating a high degree of authentic leadership, we have been able to attract and retain passionate, hard-working individuals who are willing to learn how they can advance the department’s revenue generation efforts. In my time at NIU, we have strengthened and sustained revenue generation mainly because we have persisted with and prioritized it. During the budget impasse and every day after, my colleagues and I have worked to build awareness and consensus about what a financially resilient department looks like. Central to our enduring commitment to revenue generation has been a commitment to the student-athlete experience. It can be easy to be drawn incrementally or unintentionally away from your primary focus and so, at NIU, we constantly remind ourselves of the need to advocate for and secure the funding required to provide our student-athletes with a transformative experience. By effectively and consistently sharing the student-athlete story, articulating the needs of the department, thinking creatively about corporate partnerships that align with NIU’s Midwestern values, and providing our donors with giving options that are of personal value to them, we have, in the last five years, cultivated a 342 percent increase in revenue streams and achieved a level of financial sustainability that many believed was out of reach.